Your opponent has miniatures without magnets? Angry of losing the ball marker? Bored of seeing how the magnets in the bases stick or repeal each other? These balls have a flexible open ring that will keep them around the feet of the miniatures, or you can put them bag style, holding them around the body so the model "carries the ball". No more magnets needed, no more bouncing and rolling balls disappearing. 11-15mm tip-to-tip, 7-8mm diameter, balls for table top fantasy football games like Impact Elfball or Heresy Deathball. Holder ring diameter 20mm to stay put in most common bases and at the same time be compatible with big miniatures. 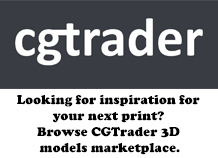 Sand and clean the models to fix small "cast" lines and remove any left over material from production. The material is porous, so apply multiple thin coats of primer until it seals. Thinned putty is also a good seal for the balls, but the rings should only get flexible paint (and varnish), preferably in same colour than final surface, for a long lasting look. 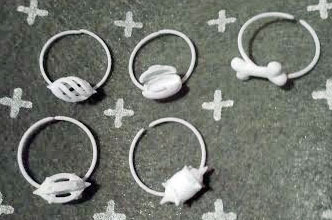 Paint the rings to match your bases or team colours, with acrylic paint. Brush-on flexible varnish and static grass can mimic the bases surface too.